The yeti finally arrived earlier this year - I call it so, because for almost twelve months until BVE 2016 we'd only seen it in pictures! So getting my hands on one in a real word environment was an absolute no brainer, when Simon Tillyer dropped me a line offering the opportunity to review the camera for KitPlus. I'll cut right to the chase with the review. Many reviews of the camera are available online and for the most part they are very positive. Instead of filming pretty pictures in my local park with the camera I opted to really try the camera out against a big gun in the 4K world and two cameras I shoot with a lot. And so it was deployed on several jobs alongside three Sony FS7s for a finance conference and then alongside a Sony F55 for an online commercial. Ursa is a stellar name indeed, a Latin word meaning 'bear' that conjures images of the Great Bear constellation Ursa Major. So is this camera a new star? Is it indeed universal? It seems that a good place to start is with the ergonomics. As an operator, this is not just how does it feel in the hand or on the shoulder, but how simple is it to operate, where the key functions are etc. Immediately you are faced with a problem. In order to power the camera on, you have to flip out the LCD screen - this is the first shortcoming with the camera. The second is that the LCD screen does not rotate all the way around. If you could flip it (like you can on an Arri Amira viewfinder) you would be able to access the menu on the touchscreen and amend settings as desired, or better still; if you could detach it so an AC can adjust settings and so forth that would be amazing (as you can with the Panasonic Varicam). The addition of the handgrip is very useful, deployed as well by other manufacturers since the Sony FS7 came to market, and there are no doubt other third party solutions that I dare say will improve on the Blackmagic style and function. There's a good variety of configurations that you could run the camera with, and a tonne of mounting options. For the most part on my first shoot, I moved between shoulder rig and Steadicam using a VCT plate. I just removed the top handle and EVF to go on the Steadi. Perhaps a little harshly, I previously described the camera as looking like it was designed in 1970s Russia, maybe this isn't a bad thing? It feels robust enough and pretty well made. The V-plate feels a bit plastic and brittle, and I wish they had put plastic caps to protect the SDI ports on the camera, small but in my opinion important details. Unlike the Sony FS7 you do at least get TC IN as standard on the camera body (no need to purchase an extension back). I found the XLR audio inputs to be a little awkwardly located, and the fact that you can't dial the input levels up or down whilst shooting a vox pop was a problem for me (they are located behind the LCD). Save for some of the basic shortcomings, an Ursa plus is the fact that you really do have all the connections you would want on a professional camera really, so hats off to Blackmagic there. The initial couple of days I did without updating the firmware to the new 4.2beta. I honestly wasn't enamoured with the lack of options in the menu system, the level of customisation available. That said with the Samyang primes that Blackmagic Design supplied for the review the images were lovely. I shot Pro Res UHD 3840 x 2160 25p. Mainly because of the need to turn around the images quickly. At this stage I wished I was able to load in custom LUTS and shoot off frame rates but after filming a load of GVS of the venue and people arriving the day gave way to a tirade of quick fire interviews. The EVF was for me a critical part of the setup, I always use a viewfinder and want something I can trust. The EVF is okay, the image is pretty decent for critical focus and works well enough once you have it set right. It took me a few interviews and tweaking settings to be happy with it. The image is better than the rubbish stock loupe that you have with the FS7 but it's a long way off the quality of the DVF-EL 100 F55 viewfinder - that's kind of anticipated given the pricing, but it's not too dissimilar in price to other third party options (UK£1,345). The one slightly disconcerting aspect was that the automatic sensor in it turned the viewfinder off a few times mid interview, so I was shooting with no picture in the finder - I kept quiet and carried on pointing the camera nonetheless! Cabinet ministers don't like the cameraman telling them they have no picture in the viewfinder and asking please hang on a minute. Beta 4.2 Firmware What a difference a data update makes! After my first two days shooting with the camera I did the firmware update in preparation for my second and main test shoot with the system. Wow! Blackmagic Design really went to town with the update. Welcome to the 21st Century. The menu system seems to have taken a thing or two from the RED way of working and you can now access all the functions neatly grouped together on different pages in a sleek and stylish way. It is incredibly intuitive and a delight to operate and select the functions you require (unlike the Sony F55 Menu which takes a good while to get to grips with). It felt like a completely different camera system. Off frame rates were suddenly available together with the capability of recording up to 120fps in HD (not far off the 150fps available on board on the FS7 and F55). Also the ability to import custom LUTS from resolve off the CFast 2 cards is a great addition that will certainly help attract people to the system. The second 'review' shoot involved filming people and some promo models throwing paint at one another, it was time to put up the images alongside those from the Sony F55 (with Canon CN7 Full Frame servo zoom). The location didn't have as much light as I would have liked, but it was a good test for both cameras as I had no choice but to work with mostly available light. The ISO range could be greater on the camera but with an Astra Bi-Colour LED Panel light (equivalent of a 2K output) I was able to shoot at 400 ISO quite happily. It's a real shame that Blackmagic Design were unable to give us internal ND filters at this stage - all of the cameras it is competing with in the marketplace have this and it's essential that they address this issue going forwards. 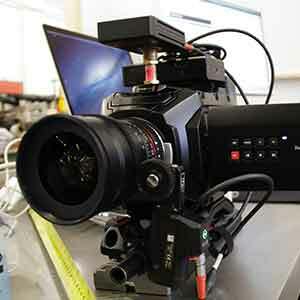 It's fantastic what Blackmagic Design have been able to achieve with their camera manufacturing in a few years and one can only imagine that they are going to continue to go from strength to strength. They seem to want to listen to the professional market and improve what they are offering. I hope that they follow the RED approach a little bit. I like the fact that the camera is configurable. If they can make it even more modular and take influences from the likes of the Arri Alexa Mini, the Red Dragon and the Panasonic Varicams then we ought to see some exciting developments over the coming years. It's a serious piece of equipment no mistake. The image genuinely stacks up very well against the F55, that's testimony to the great job that they have done with this camera. A£6000 setup intercutting alongside a£50,000 setup. I wonder whether rental houses will get to a stage where they purchase them? There are a variety of situations and people who are going to love shooting with the Ursa mini 4.6k. I certainly did. It works brilliantly on the Steadicam, has great dynamic range (apparently 15stops), and a disturbingly good image quality generated by it's enormous super 35mm sensor. I'd like to see the colour science improved with more detailed options in camera but given what they've done with the new beta firmware I'll wager that's not far off either. 4K and beyond acquisition seems to have been democratised by several leading camera companies; whilst the camera probably isn't the completely universal do everything solution that Blackmagic Design would like it to be it's certainly got a wide array of applications. It's a camera not without its shortcomings but it certainly is a star performer in terms of value for money and image quality. List price of 4.6k Ursa Mini EF, Viewfinder, Shoulder Mount Kit£5,904 Sony FS7 around£7,000 plus accessories.